Followers of my beauty treatments section will know that I love results-driven facials that actually transform your skin, rather than just being a nice lie down in a dark room with whale music. As relaxing as conventional facials are, I want to see a difference. Boy, did this happen with the SKN Rehab Signature Facial. The pre-visit information said it would make my skin look airbrushed – sure Jan, I thought. Oh my days, I was glowing immediately after this treatment, but in the days that followed my skin was so smooth I didn’t even recognise it when I applied makeup. I suddenly needed a lot less foundation for coverage, it really is game changing. I was extremely lucky to be invited to try the treatment with Julia Fenton, one of SKN Rehab’s founders, which was a great opportunity to hear about how they set up the company, and to also pick the brains of someone with decades of skin care experience (the before and after photos she showed me of acne scarring repair work she’d done blew me away). The great thing about this facial is that each step is tailored to the individual needs of the client, so you can really work on your problem areas. The treatment starts with diamond microdermabrasion, then negative and positive galvanic micro-currents are used to help the products penetrate the skin to feed the cells. Julia tells me this is hospital-grade equipment, it sounds impressive and feels very relaxing to have metal rods run over the face. 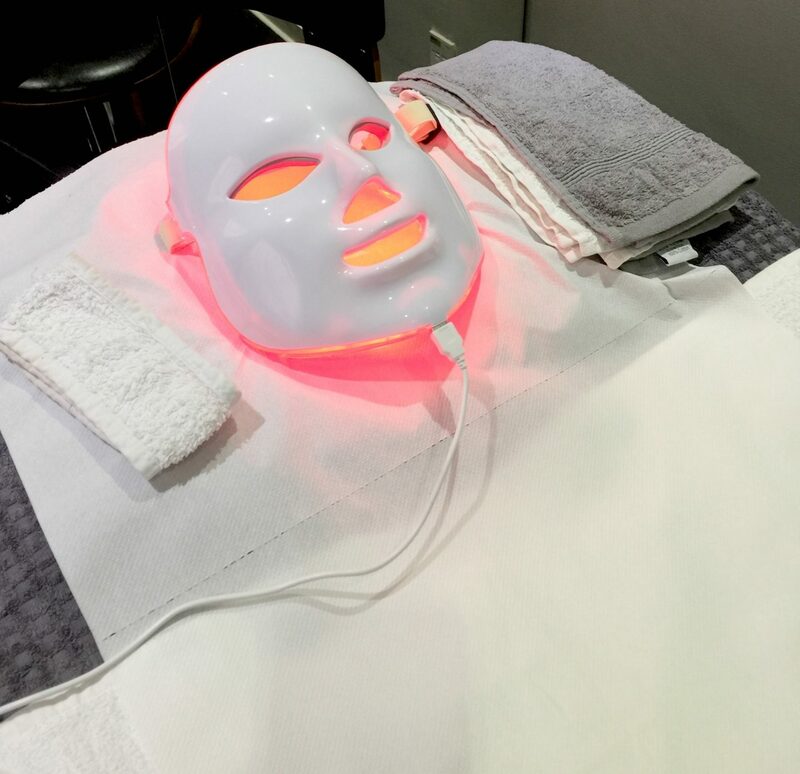 The LED mask (above) is worn for ten minutes to target different skin issues from acne to wrinkles or skin pigmentation. I’m not going to lie, I felt a bit uncomfortable at the thought of being encased in the mask, and had a weird feeling that I wouldn’t be able to cough (and then started having a coughing fit). It is absolutely fine, of course. The mask definitely doesn’t encase you, and yes you can cough and even talk with ease if you need to. Within a ten minute period I went from feeling apprehensive to being so chilled out I almost fell asleep. The final stage of the facial is a refreshing boost of pure zeolite oxygen, I instantly looked about ten years younger and my skin felt incredibly soft and hydrated. SKN Rehab includes skincare and treatments, and is available at various locations where the price will differ depending on the salon. Medically proven technology and powerful skincare ingredients make this unique treatment ideal for targeting ageing, acne, scarring, enlarged pores, and dull or pigmented skin. I really like that this facial works on a cellular level for lasting impact, and each step uses gadgetry to really drive those results. Find your nearest salon here, and prepare yourself for beautifully transformed skin (there are also express treatments available to target specific areas).